Heavy-duty leather with cradle design keeps hammer secure, swing feature keeps hammer vertical. Fits belts up to 2-3/4" wide. Heavy-duty cotton canvas, 2 large waist pockets, 2 bib pencil and pad pocket. Machine washable. Fits narrow-type hand tools up to 10" long. Molded leather retains shape, safety snap. 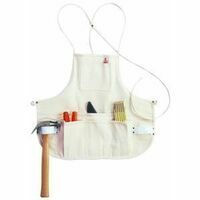 Versatile 3-way attachment, hang, strap or clip on workbelts pants, web suspenders, and work aprons. Securely holds small tools or accessories like pliers, mini-flashlights and screwdrivers; height is 7", width is 3-1/4". Fits most curved-handle knives. Fiber liner resists cut-through. Fits Belts up to 2-3/4" wide. Army pistol-type construction, 2-1/4" wide. Patented integrated fastening system designed exclusively for use with specially-equipped IRWIN "VISE-GRIP" pliers; work safer by attaching clip to pliers handle to help prevent accidental drops when working in elevated conditions; lanyard allows the user to find the right tool faster when stored in a crowded toolbox. 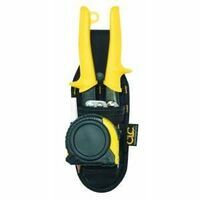 CLC Utility Knife/Plier Holder, Heavy Duty, Suitable For Use With: Belts Upto 2 in Wide, 2 in Width, 3-1/4 in Depth, 8-1/4 in Height, Polyester Fabric, Black Ballistic poly material provides strength and durability while steel loop cradle helps stabilize hammer and added padding helps keeps handle away from body. Fits belts to 2-3/4" wide. No.10 canvas bag with strong zipper; convenient storage for pliers, wrenches and other tools. 18 oz. Duckwear canvas; quick release belt fits up to 52" waists; 13 pockets to hold tools and pens; bar tacked seams. Size: 23" W x 9.5" H; 27" to 54" waist size. 4 pockets on front, 3 pockets on back and 3 inner pockets. Size: 12" x 7".